Yesterday was a gorgeous day. So warm that when I took Raven for her walk, I didn’t need my toque – note the bare ears in the photo! And bare hands – no mittens! And unzipped jacket. It was lovely. The day had started out overcast, but by the afternoon the sky had cleared and the sun shone brightly. There was a light breeze, but rather than nipping at your exposed skin like winter breezes usually do, this one caressed your face with soft, warm breaths of air. Oh, it was gorgeous. The sort of day where you just want to close your eyes and soak it in. I took Raven up the road to the abandoned property, where there were a couple of very old wooden chairs tucked at the edge of a clearing in the woods, where I could sit and do just that. The photo just can’t capture how beautiful the day was. Today was lovely, too. Not quite as warm, so those delicious pockets of warm air weren’t present, but still mild and sunny, with the lingering scent of spring. Dan and I went up the road a little ways to hike around a parcel of crown land that Dan wanted to scout as a potential location for a new MAPS study site (MAPS – which stands for Monitoring Avian Productivity and Survivorship – is a banding program that helps give clues about the “why” to complement the “whether” species are declining that other studies, such as the Breeding Bird Survey, detect; through the use of banding the program helps to determine birth and death rates, as well as other important information on territories and dispersal). We hiked about two kilometers, returning to the Jeep with our feet soaked by the soft, melting snow that still covered much of the woods. But what a splendid afternoon. The sun and mild temperatures have melted the snow off my small little “garden”, the bit of earth that I cleared and planted with bulbs last October. I planted six types of bulbs: crocus, mini iris, scilla, allium, Nectaroscordum, and fritillaria. The latter three are all late spring bloomers, although the fritillaria might start blooming in late April. The other three, however, are all early spring bloomers. I did plant the bulbs in a particular arrangement last fall, but I can’t remember what went where now. 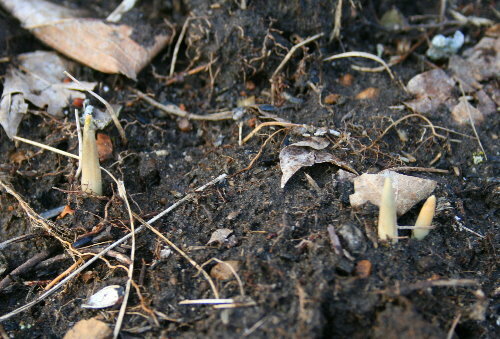 There are shoots poking through the soft dirt already, encouraged by the warm sun and mild weather, but I don’t know who they belong to. I’m looking forward to their blooms! And finally, the first moth of the season! I was standing outside last night, waiting for Raven to pee. Raven, however, was feeling a little freaked out by the barks of a dog a kilometer or so down the road echoing up the lake. When she gets like that, she won’t pee, despite much coaxing (she does know the command, and under ordinary circumstances will go right out and pee quickly and we can go inside again). So while I stood there waiting for her to gather her courage or whatever she was looking for, a moth flew in and started fluttering around our yard light! I quickly dashed inside to grab my insect net, and snagged it from up on the wall of the house. I suddenly didn’t feel so annoyed with Raven for taking her sweet time. The moth was a Morrison’s Sallow, Eupsilia morrisoni. 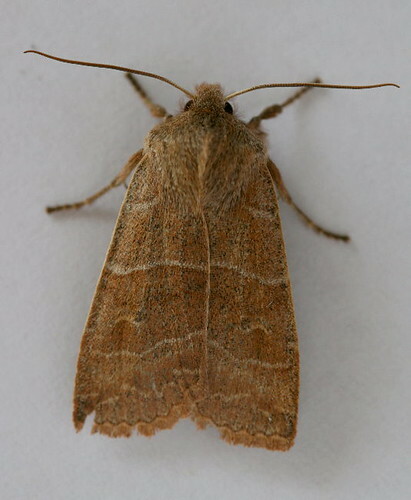 They are relatively common and widespread, and among the earliest to emerge in the spring, having spent the winter tucked into some crevice or nook as an adult moth. They will occasionally make appearances during the winter on exceptionally warm days/evenings. Although our temperature made it up to 12 C (54 F) during the day, by the time I was putting everyone to bed at midnight it had dropped to 2 C (36 F) again, and while I thought perhaps the warm sun might have roused somebody from their winter slumber, I had expected any moths to show up would be in the first hour or two after dusk, while it was still somewhat warm. I was quite surprised to see a moth out and about so late, after the temperature had dropped so much. I tucked it in the fridge overnight (it’s actually warmer in the fridge than it was outside, ironically) and took photos and released it this morning, setting it in the sun where it could warm up and then go off to find its own nook to crawl into again. Oh wasn’t it just lovely? I was out Saturday morning trying to get a better shot of the otters on the ice and just loving the soft breeze. If my ears do not lie, the blackbirds are coming back and I heard a goose or two (that’s really early I think!) The birds at this end of the lake have been a lot more obvious– the crows have been very active and there is more bird sound in general. 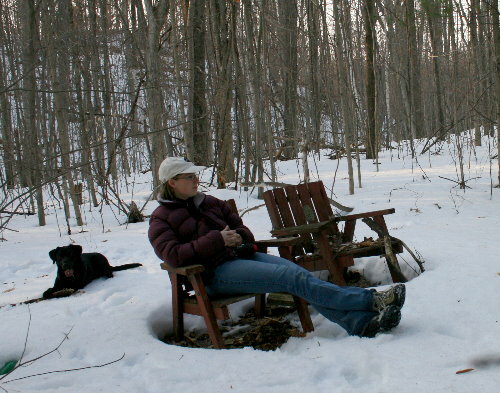 If it is nice tomorrow I may have to take my coffee outside (a traditional rite of spring around here). Oh, boy! Your first moth! We had our first chipmunk yesterday! Now it’s wait and see, everyday, for what’s new!! The fun begins. Today we had a ROBIN! That is really early for here. I had to smile about your gardening comments, so much like my mum: “And something’s coming up here — can’t remember what I planted…” I think that’s a sign of trust in one’s plants, or maybe of an openness to being surprised. Barb – seems a bit early for morning coffee just yet! Although we’ve had a couple of simply splendid afternoons where I could’ve sat outside in the sun for a little while. Kaholly – that’s the best part about spring – the anticipation and discovery! 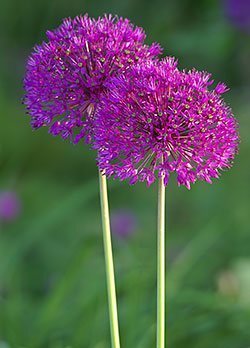 Lavenderbay – I think it makes gardening a whole lot more enjoyable when you’re not fussing over labelling things or remember what’s what. Just put it in the ground and enjoy!